I hope you all had a great and Happy Canada Day last week. 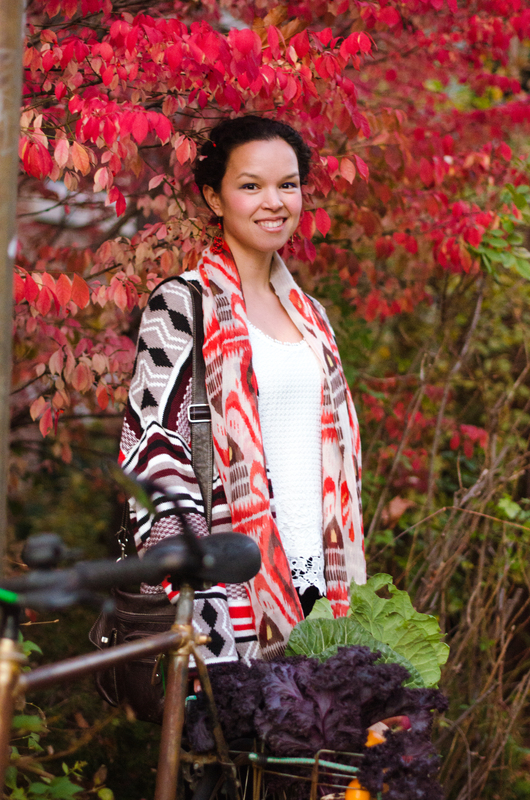 I am checking in today to give you an update on my previous month as a garden intern with Cultivate Toronto. 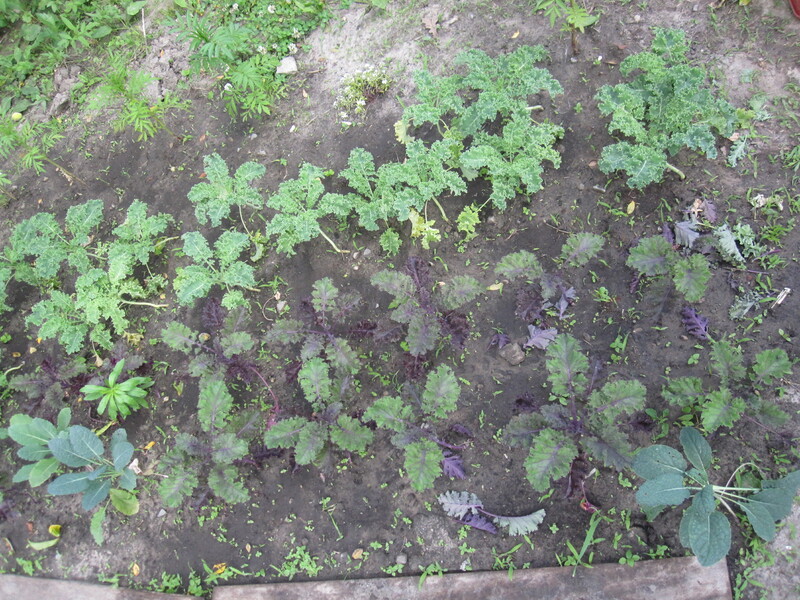 Cultivate Toronto is an organization that makes use of unused urban land, be it a rooftop or a resident’s backyard, and converts them into vegetable gardens where food can be grown by the community and for the community. 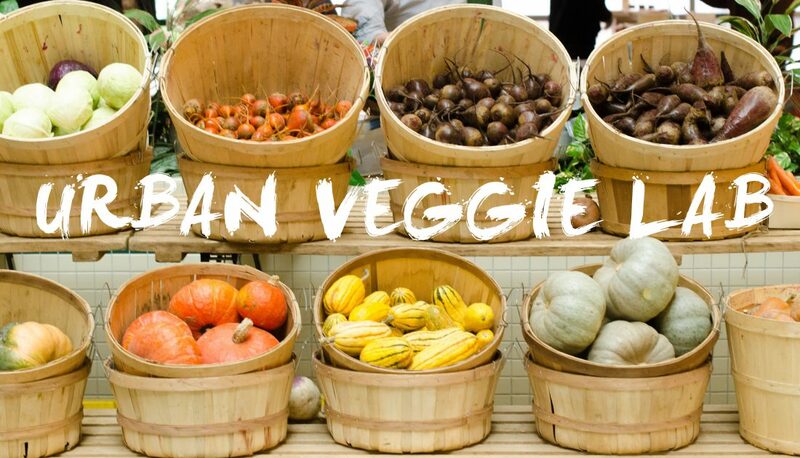 The produce is then sold at farmers markets by item or as a weekly share – meaning customers can sign up to receive a portion of the harvest on a weekly basis (this share is often called a CSA or community supporting agriculture). 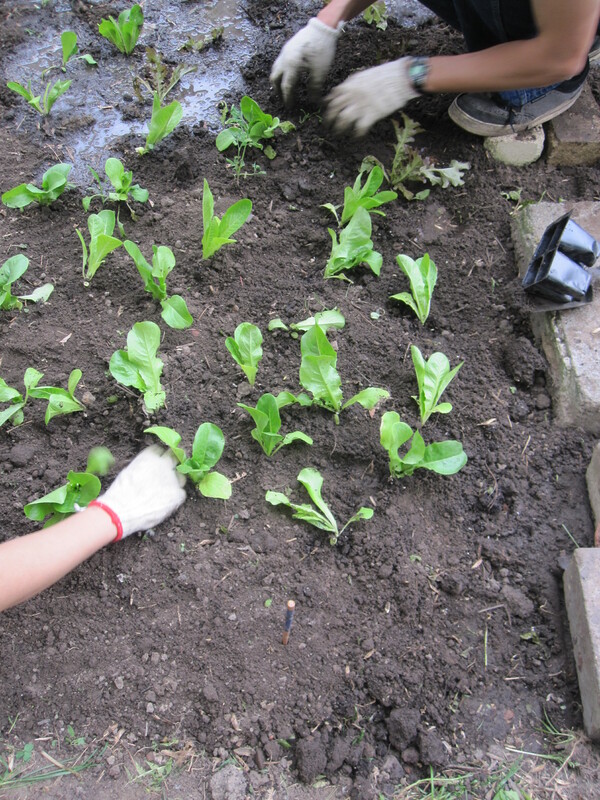 I have been volunteering with this organization for the past month and have been gardening in three backyards in the East York area of Toronto. 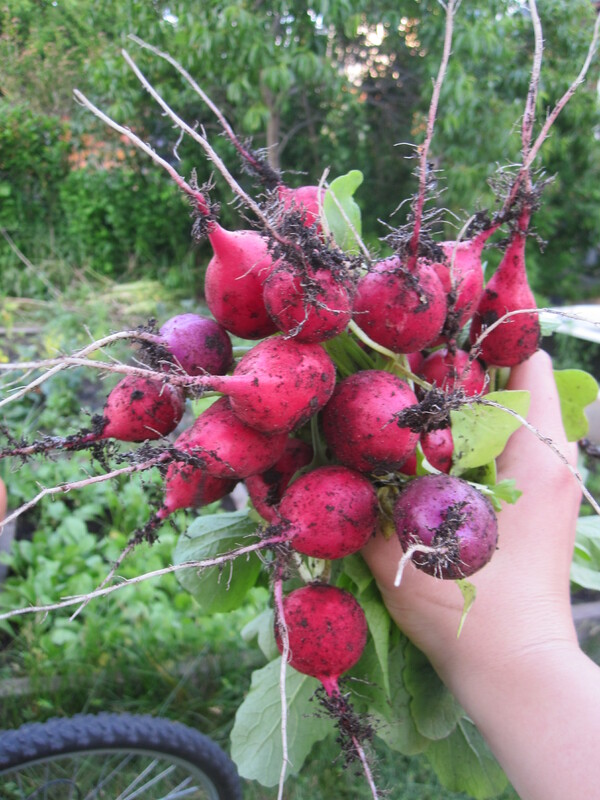 We are a team of volunteers comprised of 5-10 individuals and we plant vegetables from seed and transplant (seeds are grown in the greenhouse for the first few weeks until they develop into healthy seedlings). 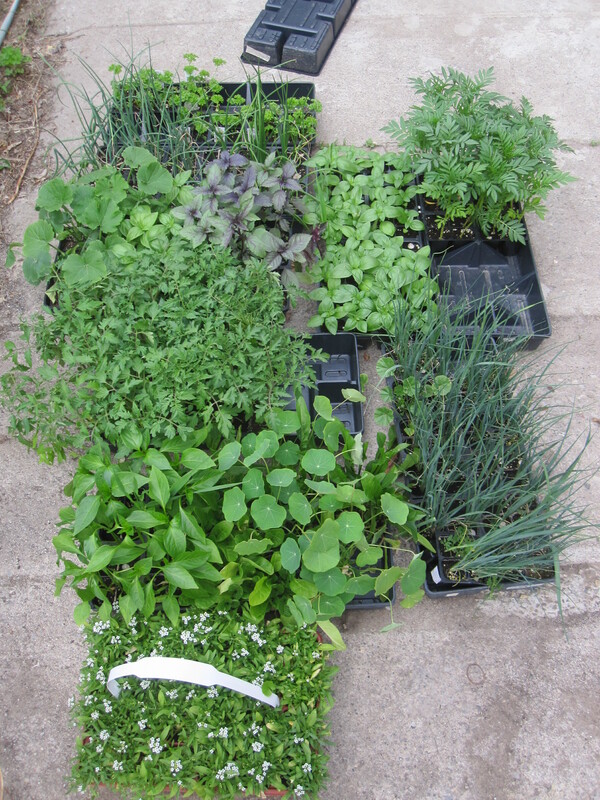 Here is an example of some of the transplants from the greenhouse. 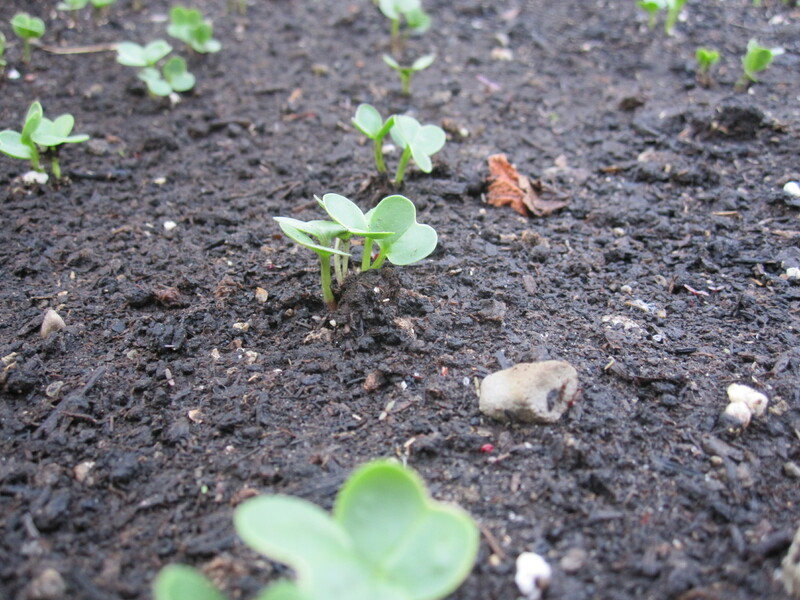 We obtain vegetable transplants as well as flowering plants, to attract bees and beneficial insects to the gardens we work with. I would like to share with you the progress of the growing season over this past month. 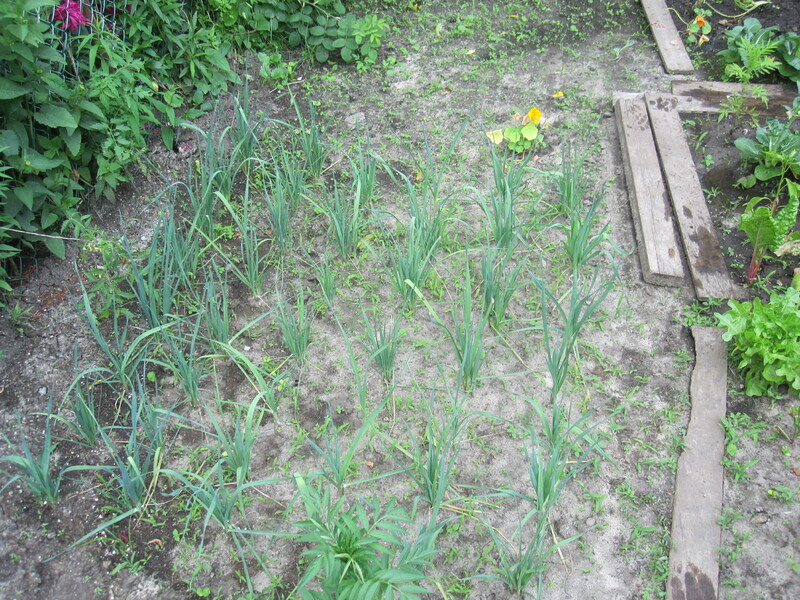 I will divide this post by house since we have three home gardens in which we are growing a wide variety of vegetables. 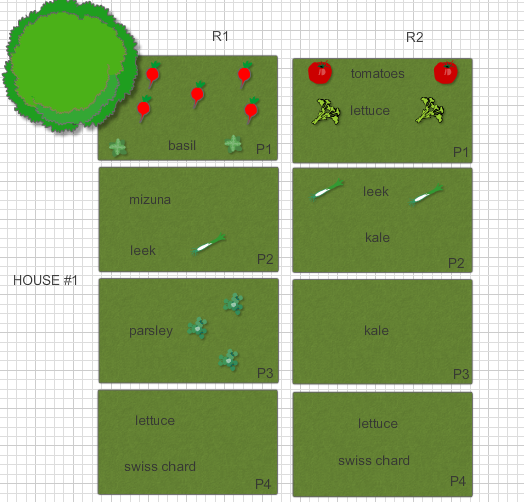 This backyard consists of 8 divided plots for growing vegetables. There is a large tree on the north-west end of the yard, which has made growing in the three left-most fields a challenge (due to lower levels of sun and cooler temperatures). 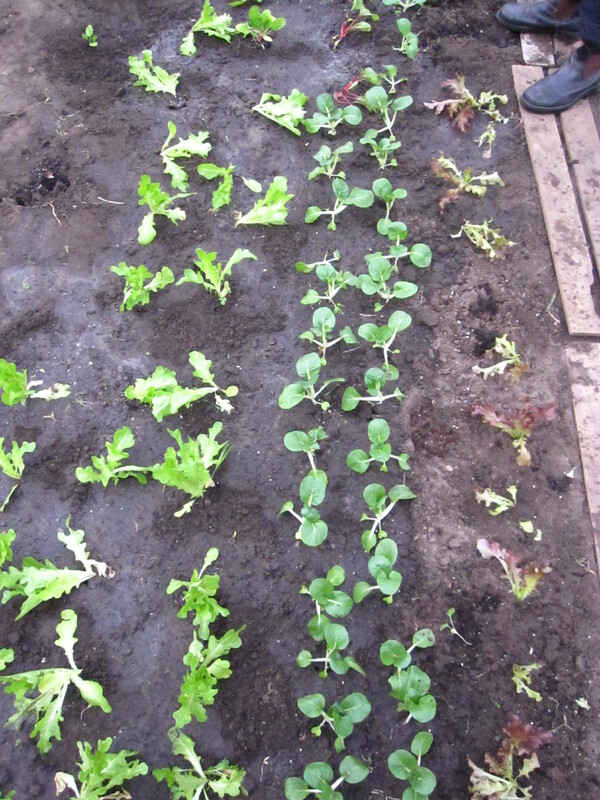 However, we have been successful in planting lettuce, kale and leek transplants on the three rightmost fields, which have grown tremendously well in the past month. 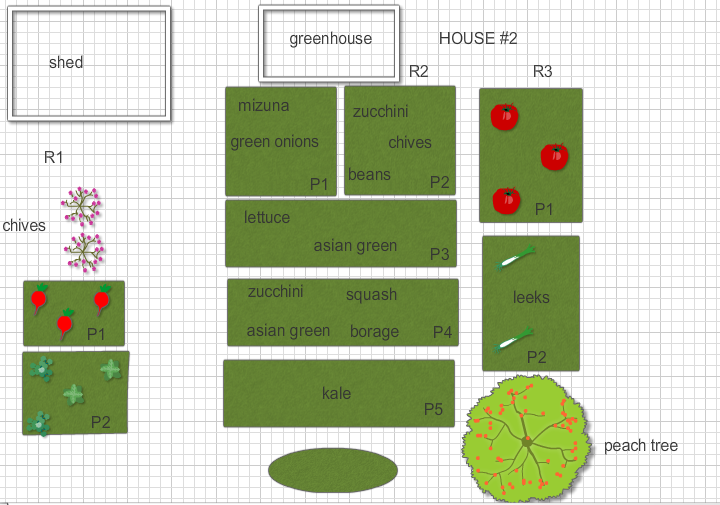 I have provided a garden plan below so that you can better visualize our setup at each location. 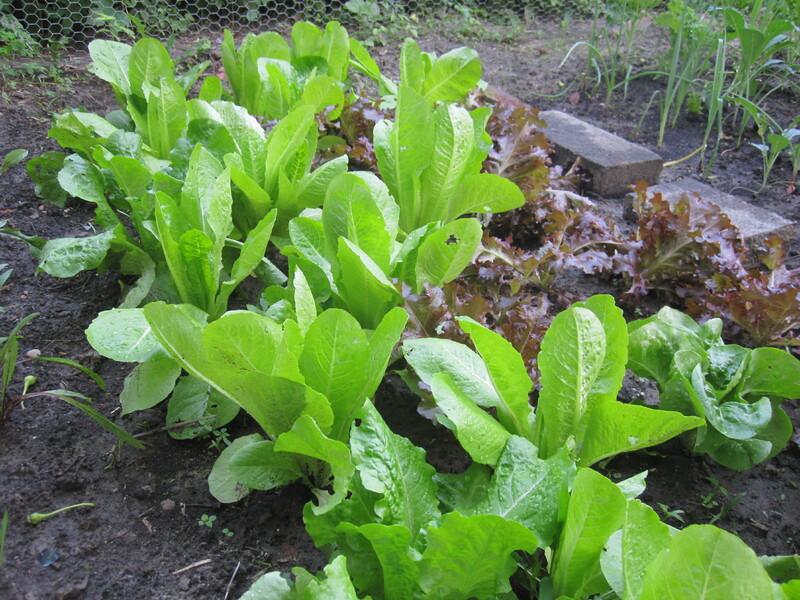 -We planted two different lettuce varieties at the end of May and the growth has been very significant after a month in the ground. 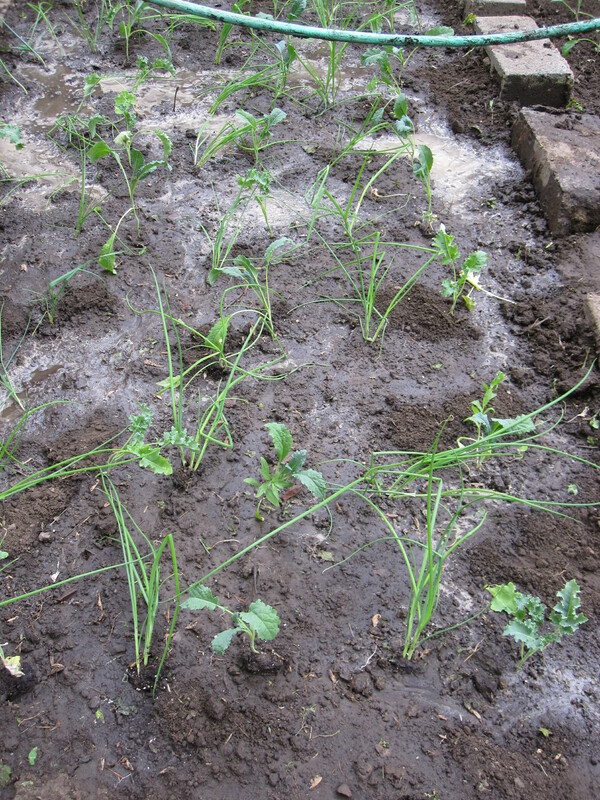 -We have planted green onion and kale transplants (two varieties) in this plot. 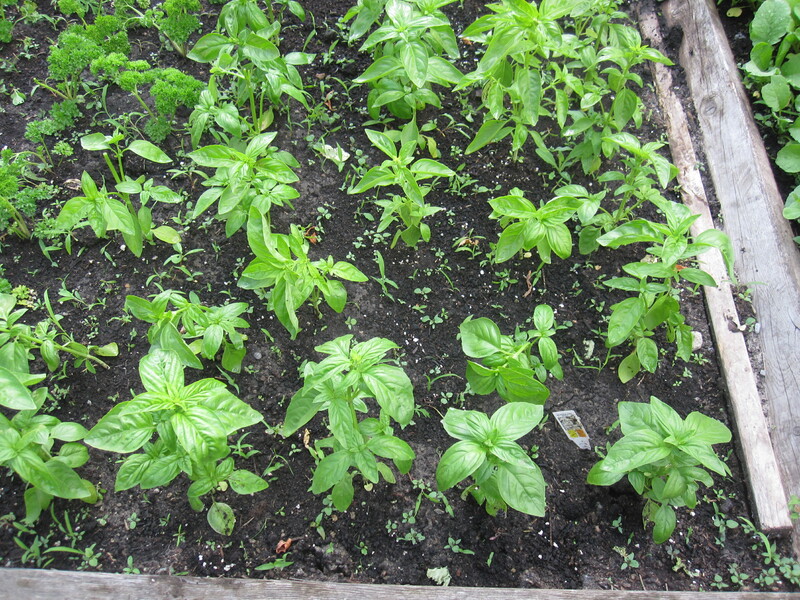 Again, the levels of sun and temperature have been optimal on this side of the yard and the plants have grown well after 4 weeks in the soil. This house is the largest of the three locations. 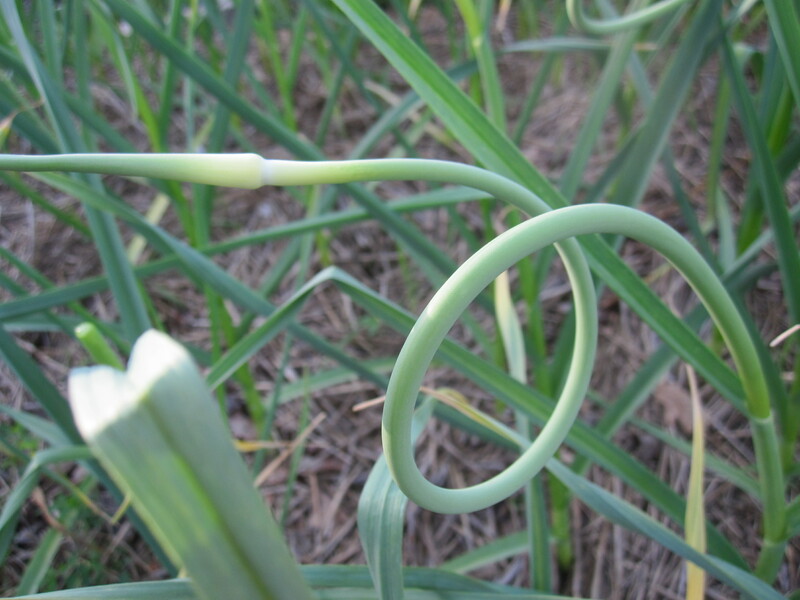 We use the front lawn for growing garlic as well as a variety of other vegetables. 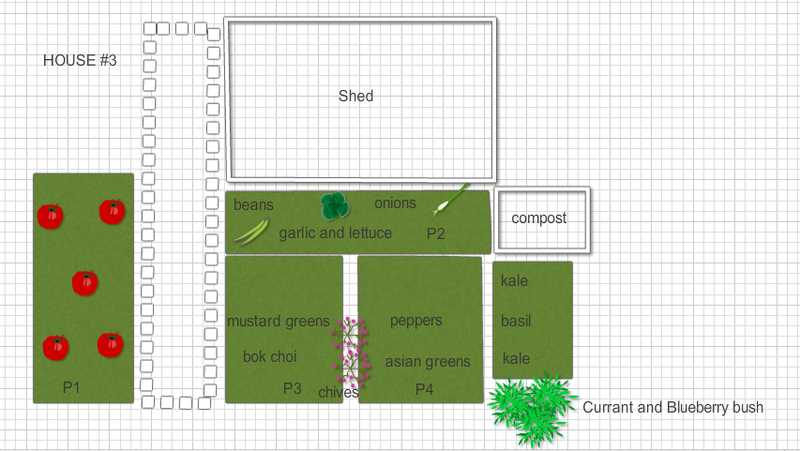 The backyard has 12 plots, as well as a small greenhouse. 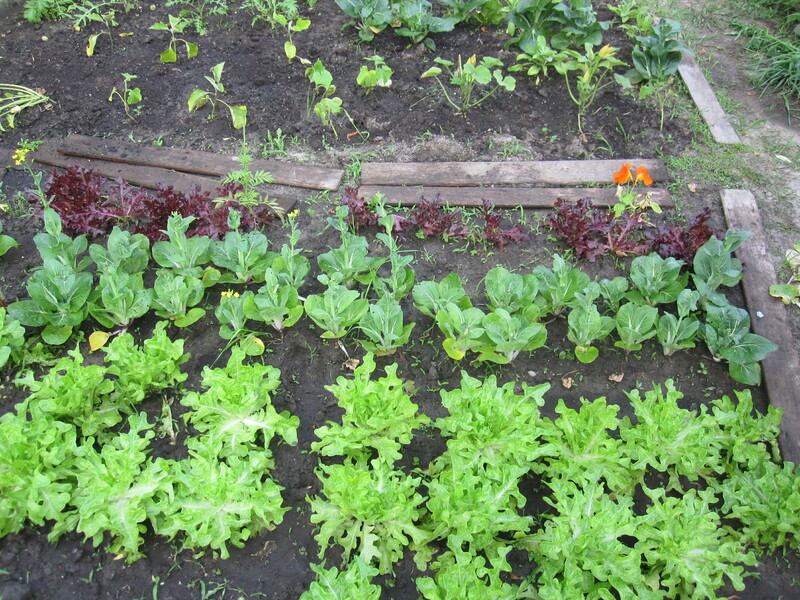 -This plot is home to mizuna, a bitter green as well as onions. 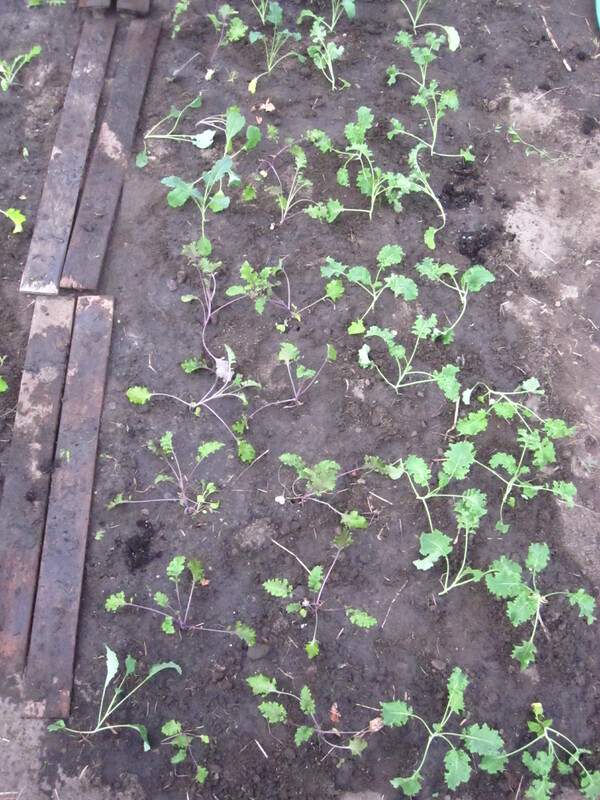 The picture below shows the plot after 1 month of growth. 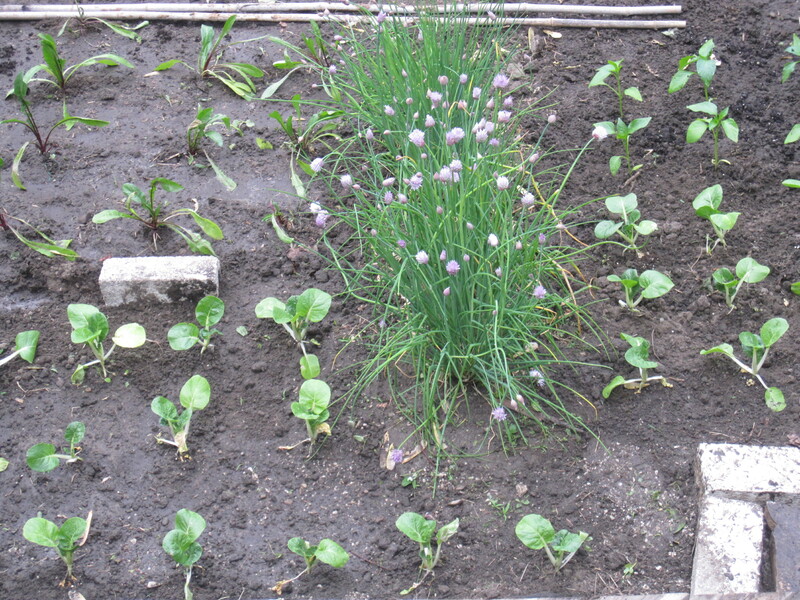 -This plot is a raised-bed. 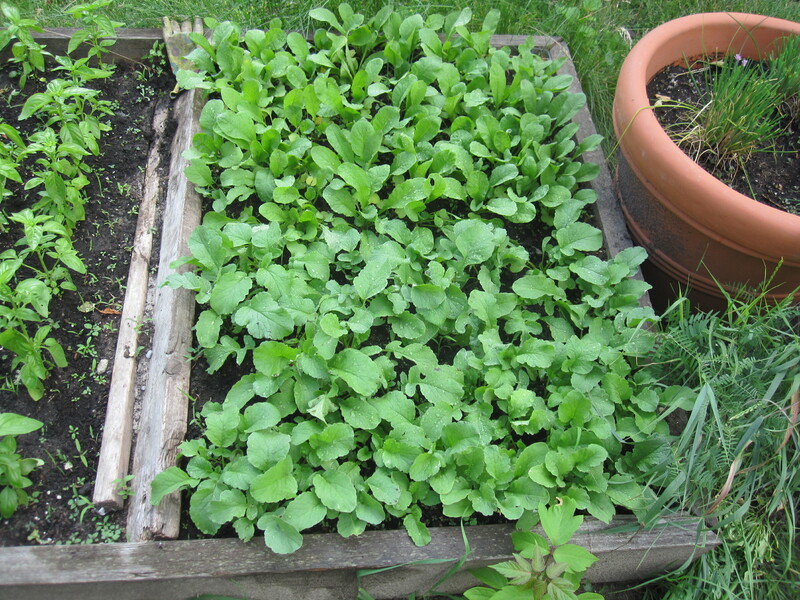 We planted two varieties of radish in this small square plot. 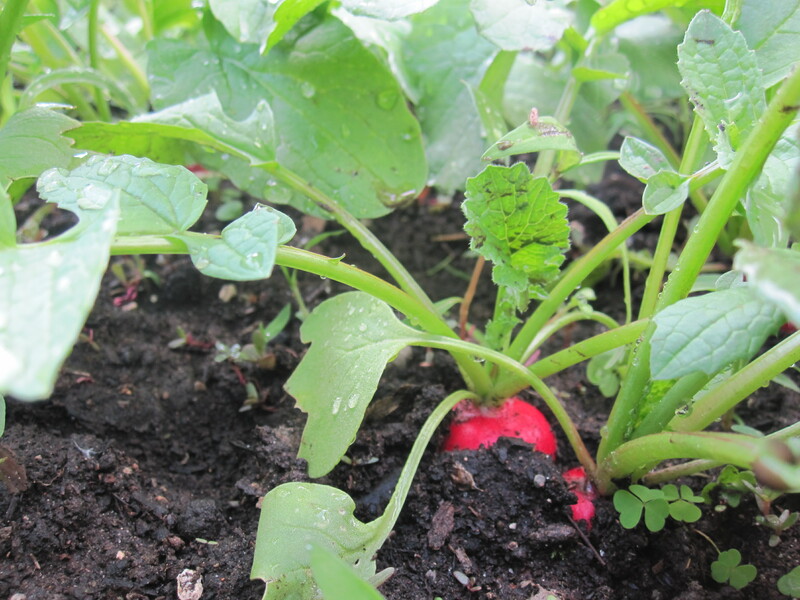 radish 4 weeks from seed, ready for harvest! 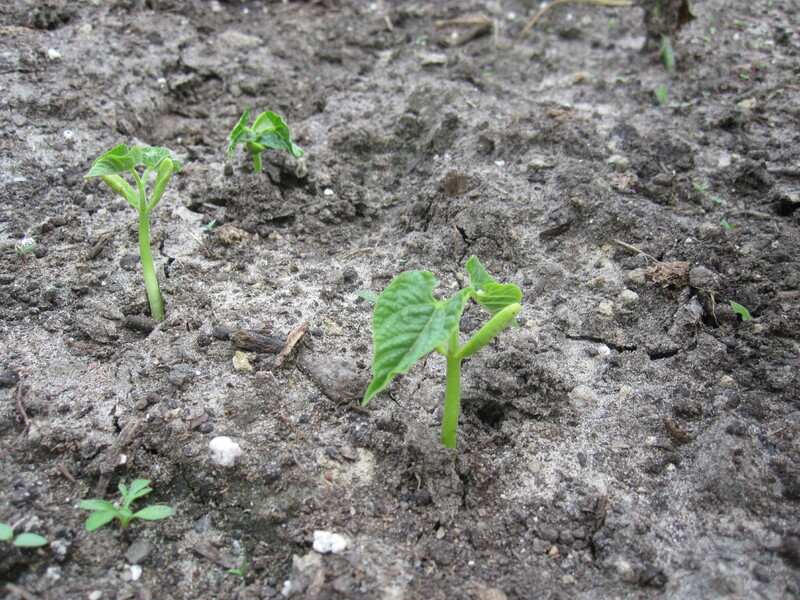 -We planted some beans in this plot directly from seed. After one week, you can start to see them sprout! 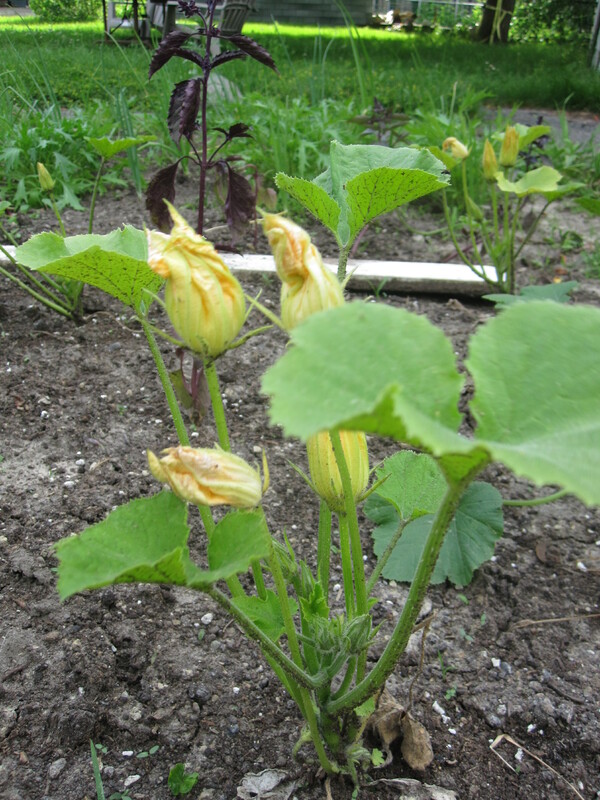 -Plot 1 is also home to zucchini, which is shown flowering after a few weeks in the ground. 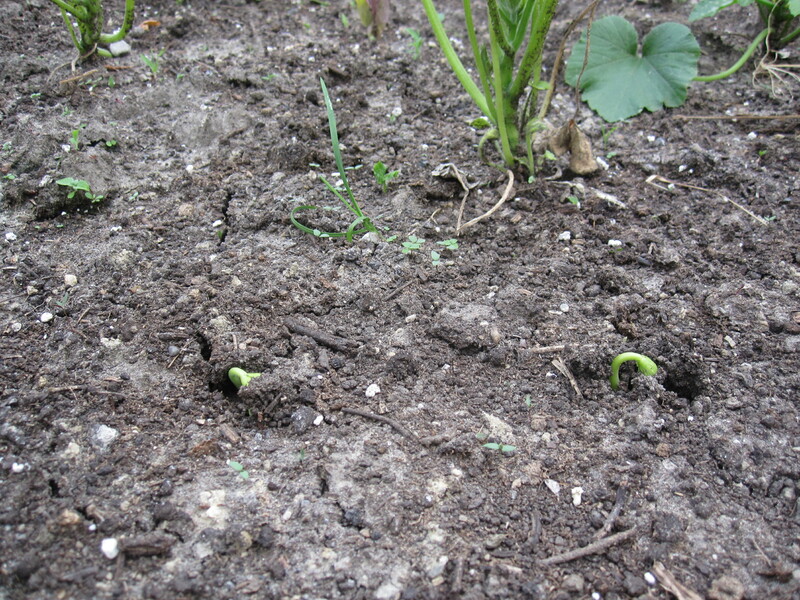 Zucchini is soon to start growing! 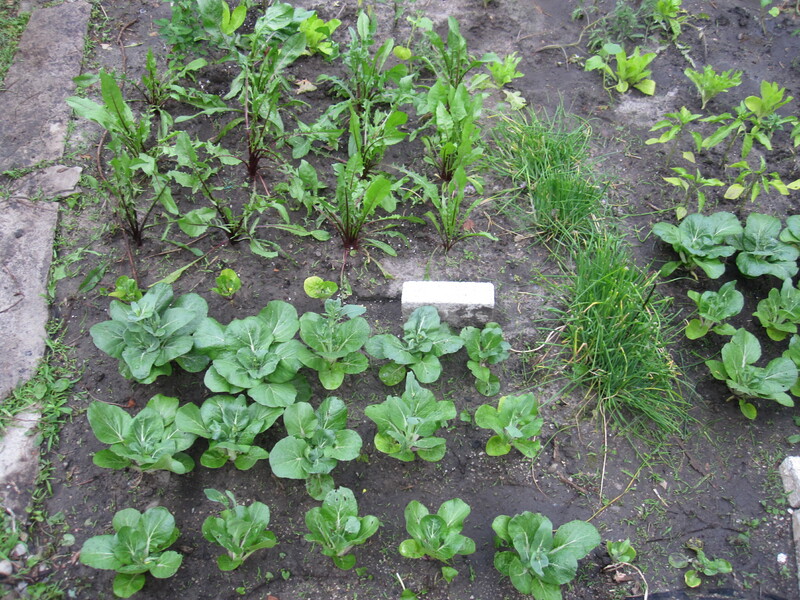 -This plot is home to lettuce and bok choy transplants. 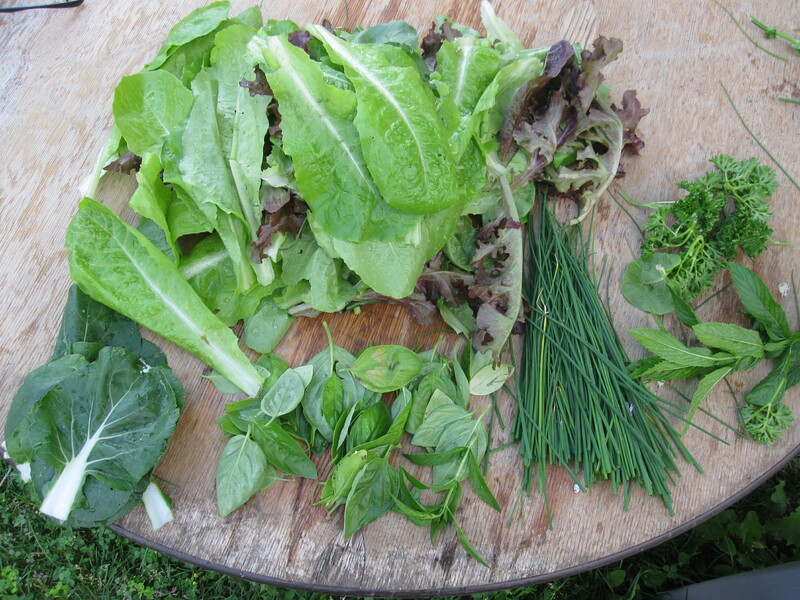 As you can see, growth of the lettuce is slower in this garden than at house #1 after 1 month. 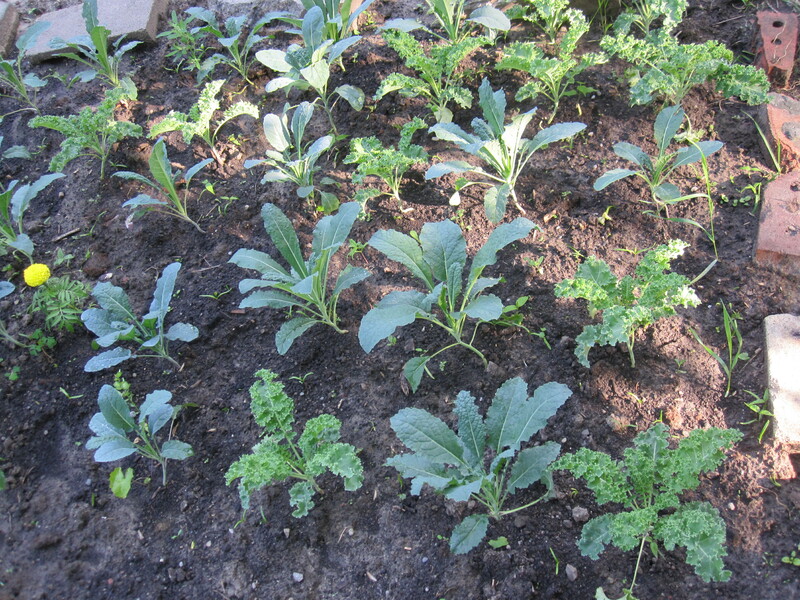 -This plot contains three varieties of kale. 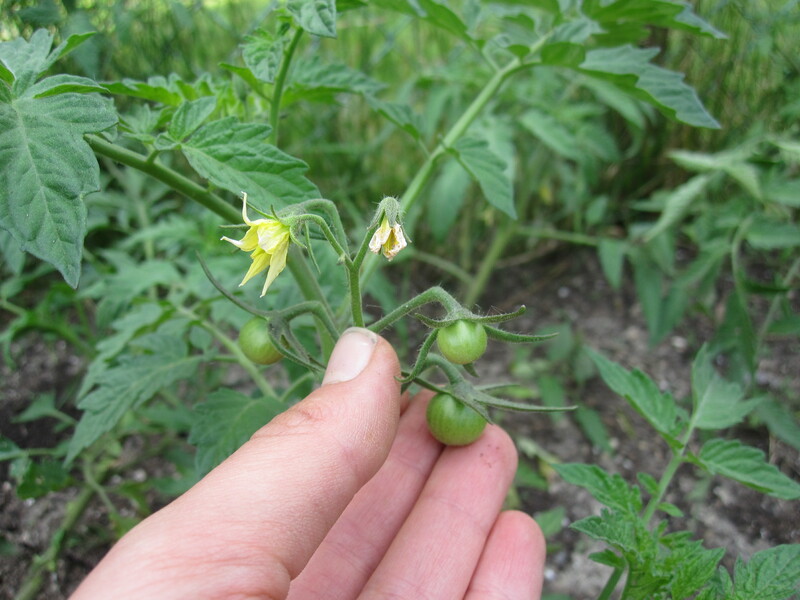 -We planted tomato transplants here and after 3 weeks, tomato flowers and fruits showed up! 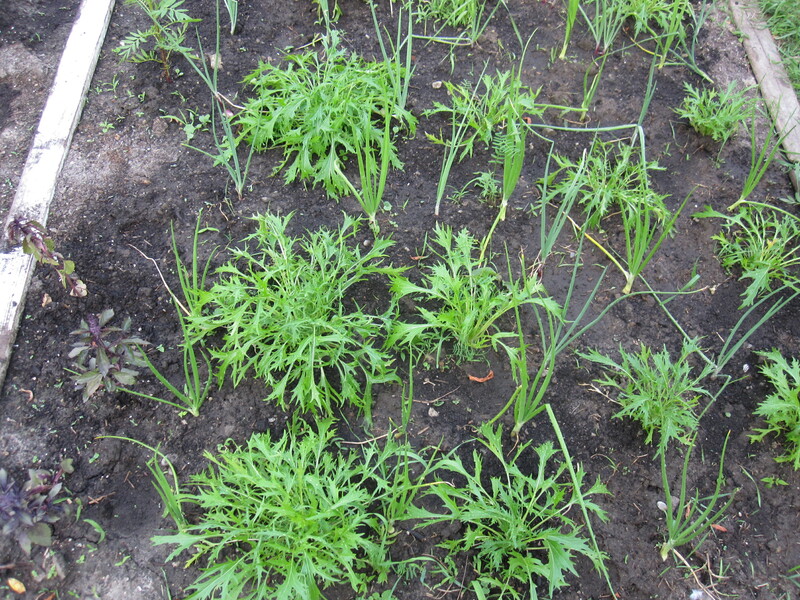 -Leek and carrot were planted in this plot. 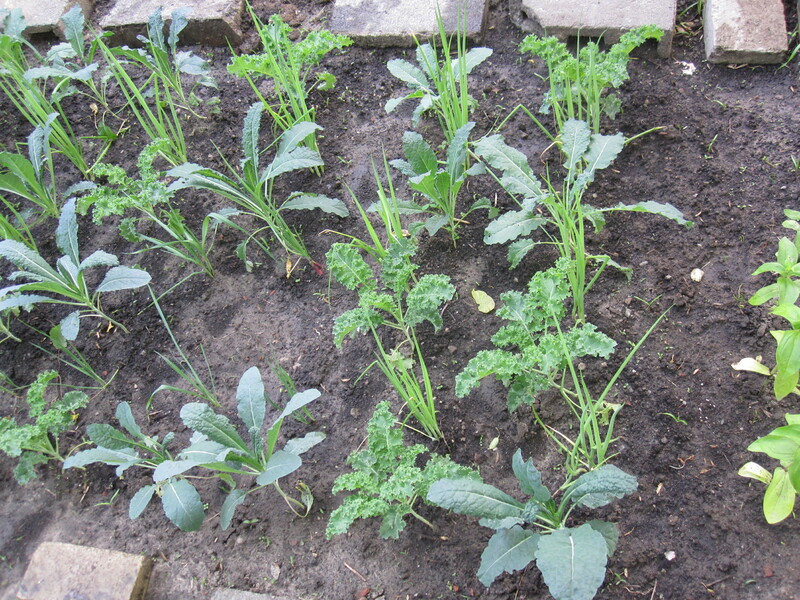 However, the carrot seeds did not sprout but the leek transplants are doing well after 4 weeks in the soil. This house has the fewest number of planted plots. However, there is a beautiful currant bush as well as lots of bush on the side of the garden to make twining tomatoes and beans an easy operation. 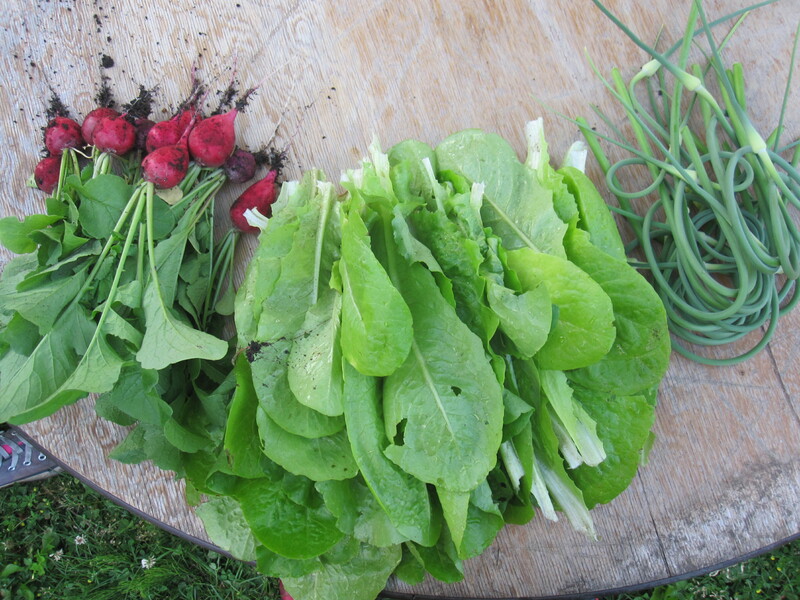 -These plots feature dandelion greens, asian greens, peppers and chives. 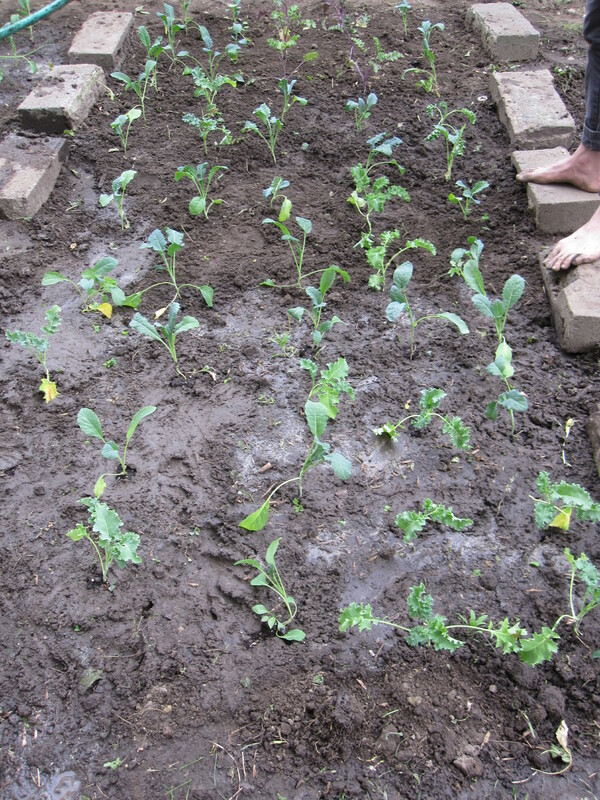 Below you can see the transplants after planting. 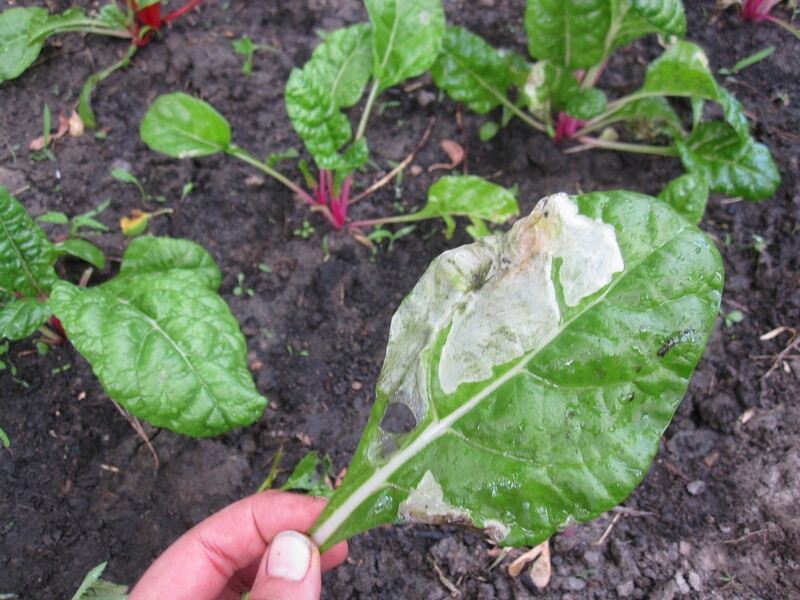 -We have struggled with the swiss chard plants, as there is a problem with leaf miners. Leaf miners are a larvae of an insect which lives in the leaf of the plant and feeds on the inside of the plant. The least invasive way to get rid of these pest is to get rid of the larvae eggs, before they hatch and bury themselves into the leaf. This can be done by manually removing the eggs, or spraying them with an insecticidal soap. 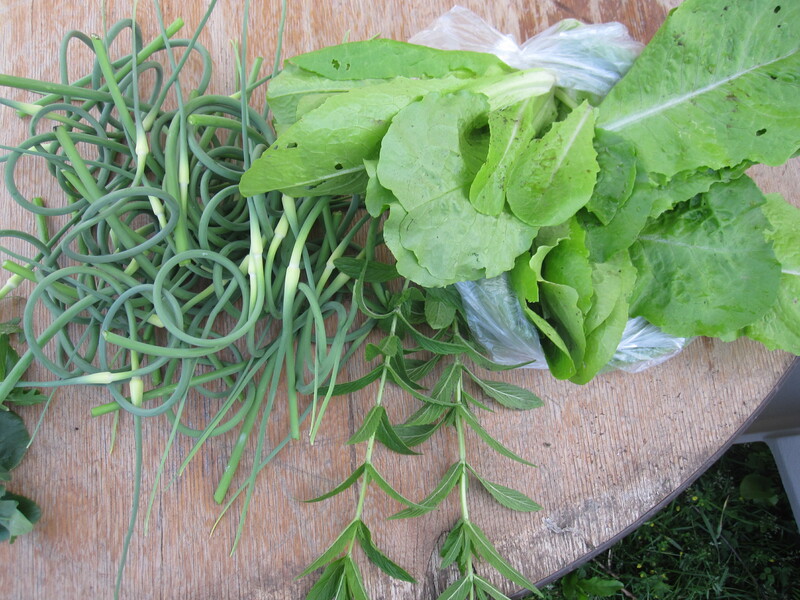 Here are a few of the harvests we’ve done in the month of June. Enjoy and stay tuned for an update at the end of July! Green thumbs of the world unite!